We are engaged in the manufacturing storage tanks of both vertical and horizontal in mild steel and stainless steel. 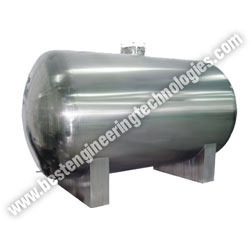 We offer storage tanks any capacity as per the buyer requirement. A farsighted approach towards production enables us to meet the growing demands of various processing industries by offering process equipment such as Herbal, Bio Diesel Equipment, Distillation Equipment, Food Processing Equipment kitchen pickle industry equipment and many more on turnkey basis. Technically advanced manufacturing unit which is equipped with latest machines and tools has enabled us to meet the voluminous demands of our clients around the year. Further, our team of experts is well versed with the industry related process and we provide an excellent after-sales-service to our clients. Providing effective consultancy to our clients for different concepts, we have been able to execute a number of turnkey projects and have become the leading choice of our clients.